While the idea of building a CDSS that perfectly fits your organisation’s unique workflows appears an obvious choice, it eventually becomes clear that maintaining such a one-of-a-kind system can be unsustainable. Medical knowledge-base construction and maintenance is a significant challenge. After the first few years of creating the knowledge base, adding new evidence to the system is no longer research – it is system development. As such, it becomes increasingly difficult to recruit a cadre of medically knowledgeable individuals who can devote substantial effort to knowledge-base maintenance over time. Creating a Clinical Practice Guideline (CPG) usually takes three to six months (or even a year), depending on the subject matter9. The maintenance of a CPG is likely to take more than a quarter of the time it took to originally develop the Guideline10. To develop CPGs, a standard set of guidelines covering all specialties, represents 12,000 hours of work at a cost of more than 1 million USD for just the content alone10. The total cost of authoring, reviewing, and EHR integration can surpass 3 million USD for just 200 Order Sets11. With the growth of Fifth and Sixth Generation EHRs, the concept of building in-house CDSS will increasingly become less favorable. As we move from logical (rules-based) CDSS to a foreseeable future of statistical (machine learning-based) systems, the decision to purchase rather than build and maintain knowledge-based CDSS becomes a sensible, convenient and cost-effective choice (Table 2). evidence-based practices via collaborative platforms. Building consensus amongst “experts” becomes easier when the source of evidence is credible. Advanced CDSS are usually built on accepted and defined standards that have been peer-reviewed and fine-tuned to provide higher sensitivity and specificity for each condition. Customisation can also be taken a step further by selecting solutions that have a content management system for ease of customising the content to fit specific guidelines of the organisation. These external CDSS may also have a proven track record of effectiveness with other organisations, which in turn results in costs savings for less ‘trial-and-error’ as compared to “building” CDSS. The return on investment is primarily in the form of reduced spending on unnecessary tests and procedures as well as avoidance of costly adverse events (and in many systems, malpractice litigation claims), and secondly in the form of saved care replacement costs that result from pulling clinicians away from care processes (to build CDSS). These savings can add up to significant amount annually – almost 2.6 million USD as per one estimation11. Furthermore, such standard CDSS implementations enable interoperability in Health Information Exchanges. As far as project implementation is concerned, an external influence provides the opportunity to reengineer improvements into your original processes. Advancements in interoperability standards also facilitate more seamless integration with EHR. Professional practice services for EHR integration and implementation support that are provided by progressive knowledge partners, can cut down the implementation costs significantly and improve the efficiency and effectiveness of a large-scale CDSS roll-out. Lastly, with pharmacogenomics becoming an emerging field in patient care, demand for this new form of CDSS is increasing. In this case, building this knowledge base seems even less of an option when considering the expertise and time needed to manage and update it. As with all third-party platforms, the convenience that comes with buying often includes challenges that need consideration. These include the integration effort for disparate platforms, investment in system upgrades and the additional effort from IT staff for monitoring the performance of these external platforms. Legacy stand-alone CDSS systems need to be integrated or discontinued. Yet, certain safeguards or mitigation plans can be considered to maximize the advantage of buying CDSS. Following the appointment of a vendor, healthcare organizations should further establish governance structures and develop a clinical knowledge management framework that can consistently track and improve effectiveness of their chosen CDSS platform. In all, keeping in mind the above considerations will enable providers to better chart out their journey towards a successful CDSS adoption. 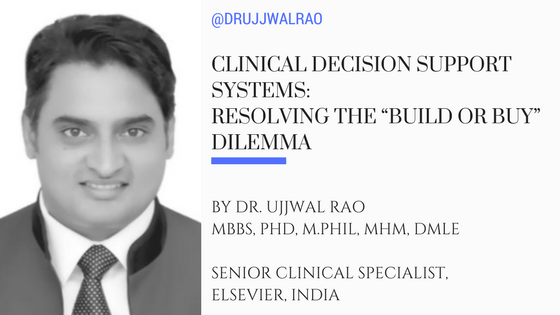 With the deluge of evidence that is often fallible and slow to diffuse into clinical practice, along with advanced EHR platform integration requirements, hospitals must reconsider their likely initial inclination towards building their own CDSS. A number of major initial and ongoing challenges with home-grown solutions, including care replacement costs, time and effort to constantly update evidence; usability; implementation and maintenance costs; and accepted functional practice integration can be overcome with the purchase of proprietary CDSS. Overall, the selection of CDSS should also involve the clinical team from the start, as well as careful selection of vendors who show a high level of willingness to partner in the transformation journey.